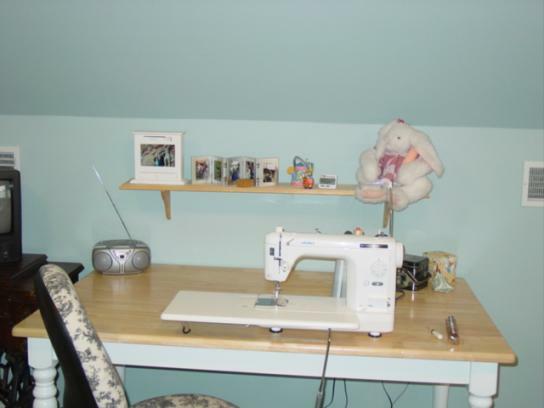 I first posted photos of my sewing room back in 2002. If you're curious, you can take a look here. You'll notice the biggest change is I've painted the room. I got tired of the white, and it was looking dirty. With no further fanfare, here are the photos. 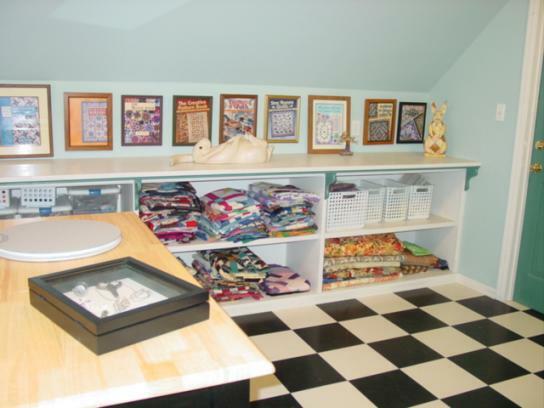 My sewing room is in a free-standing garage that we built specifically to house our business. The building is a two-story structure with a pitched roof. 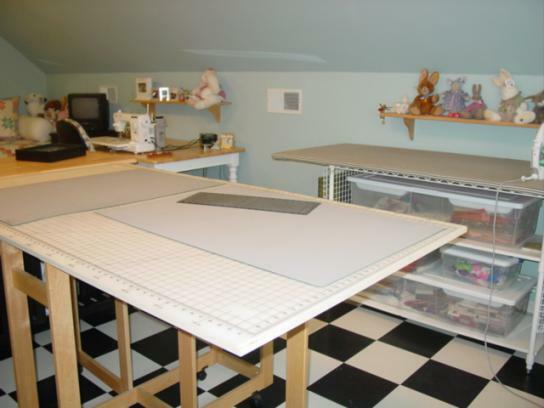 My sewing room is on the second floor over the two garage bays. We store books on one side of the garage down below, and our office is in a room behind the bays on the first floor. 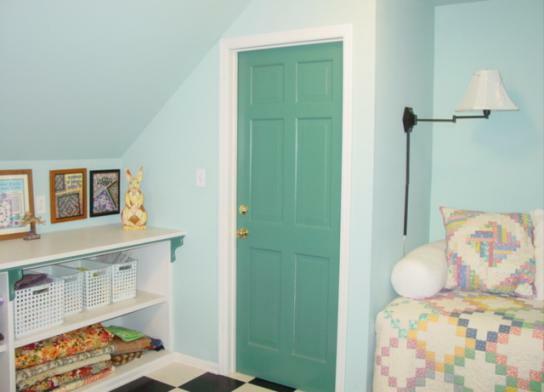 The room is a light aqua, with teal on the door, on the supports for the shelves, and around the window. The rest of the wood trim is white. 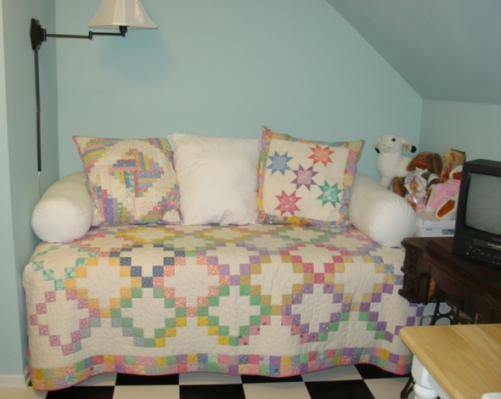 On the daybed is Texas Chain: Thrifty Thirties from The Creative Pattern Book. I often sit on it and write my books in longhand or calculate yardage for patterns. The bins have some of my works in progress. 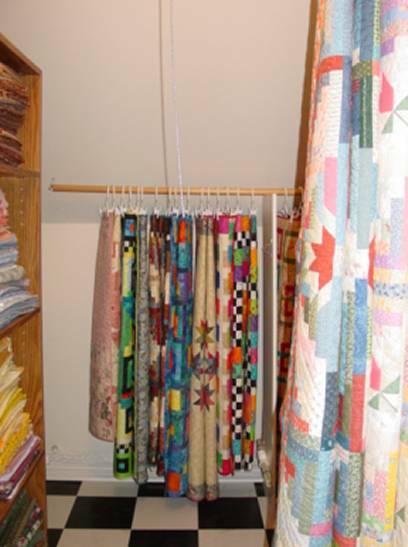 On the bottom shelf are quilts for Judy Martin's Log Cabin Quilt Book. When this photo was taken, the quilts hadn't been photographed, and the book wasn't yet out. They're folded so you can only see the backing. These quilts are now stored in a different way in my attic, which you'll see at the bottom of this page. I have all my book covers framed and on the wall above the built-in shelves. I'll have to find an additional place for the cover of Judy Martin's Log Cabin Quilt Book. I've run out of space on that wall. You can see some of my old quilt tops. I need to put a few more of them for sale on the web site. Perhaps you know someone who would like a Judy Martin quilt top to own and finish and display? Turning around and looking the other way, you can see my window to the world. Under the window are stuffed bunnies from my collection, plastic bins of scraps, and books. In the foreground is wooden table I bought to act as additional counter and storage space in the middle of the room. Next to it is my cutting table. In the corner is the ironing table I made. The next photo gives you a better look at it. I got tired of trying to iron queen-size quilts on a regular ironing board. My solution was to make something large enough and stable enough. It's 2-1/2 feet by 6 feet. In the process I added to my storage capacity. I also hang rulers and tools from the wire racks on each side. If you want to make one of your own, you can read how I did it in the March, 2002 newsletter. If you'd like to subscribe to my newsletter, click here. This is a closeup of my cutting table. It's about 3 feet by 6 feet. The leaves fold down for those occasions when I need to move it out of the way and lay a quilt out on my floor. You can see a TV next to my sewing machine. It has a video player built in. Sometimes Kate will watch a movie while I sew. This is my Juki sewing machine. I upholstered the chair myself. It didn't match the room before, and I had some toile upholstery fabric to coordinate with the new ticking on my ironing board. Voila! Now the chair fits its surroundings. Here's a good look at the daybed. I used the similar thirties fabric to make the two pillowcases. The one on the left is Rogue River Log Cabin from Scraps. On the right is Five-Star Block from The Block Book. I haven't had time yet to cover the other pillows. 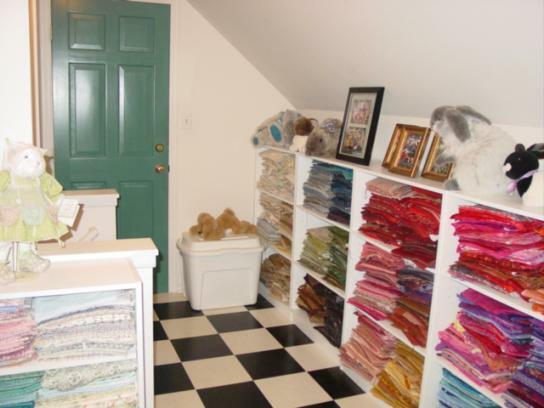 If you step through the door of my sewing room, you'll see where I store a lot of my fabric. I moved it to the windowless adjoining room. The sewing room is above the garage bays. Our office is behind the garage bays. The attic space you see in this photo is directly above the office. Out of view to the right is the furnace and more fabric and finished quilts. This is from the corner, looking back at my sewing room door. More fabric. More bunnies. If you turn back around, you'll see the latest (November, 2007) addition to my sewing and storage area: my quilt storage. The inspiration for this came from Connie Sue Haidle of Apple Blossom Quilts. 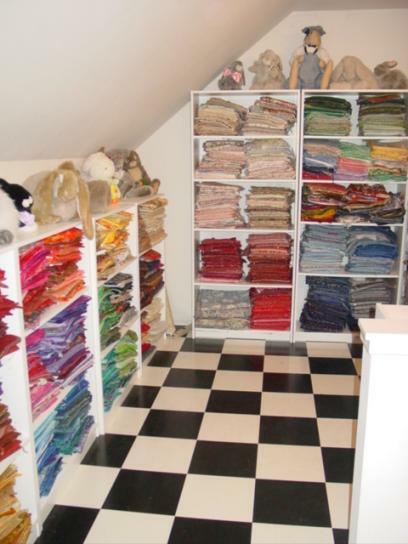 She posted pictures on her website of a closet she outfitted for hanging quilts. 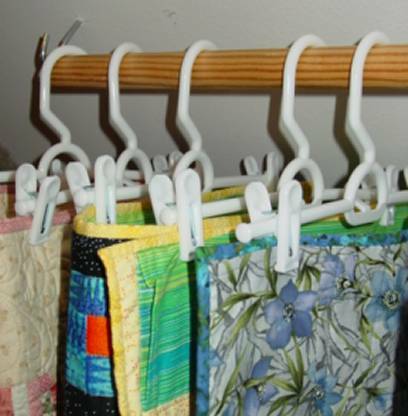 By using two to four skirt hangers per quilt and by folding the quilts in a gentle accordion fashion, I can keep the quilts from creasing, which was my goal. Another advantage of this method is that I can easily slide the quilts down the rod in order to look at them more closely and in order to pull them down when I want to redecorate in the house. The furnace is just visible above the bear in the bunny costume. 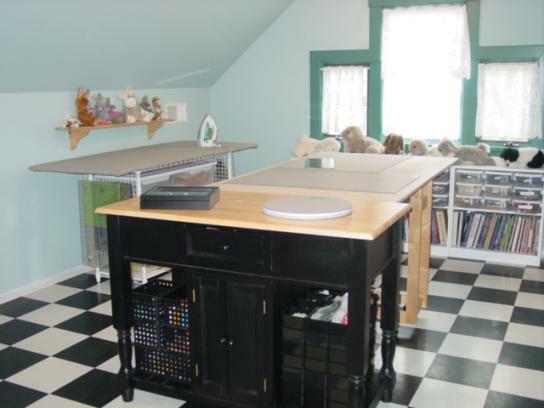 As I said a couple photos above, this whole setup is in the furnace room next to my sewing room. 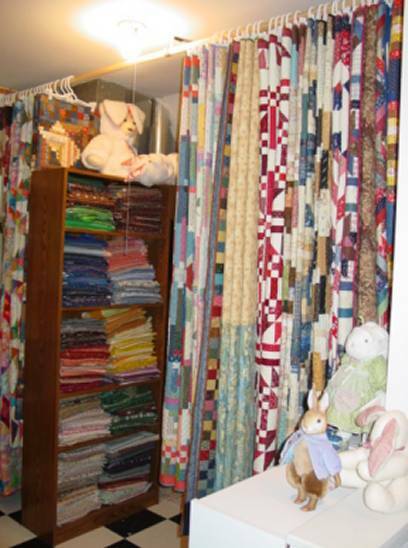 It quite possibly is the prettiest furnace room in the world now that I've added all the quilts to it! Behind the rod of quilts in the previous photo is a lower rod where I hang some of my smaller quilts. The wooden rod is the weakest link. Left to its own, it will buckle under the weight of the quilts. That's why I had to use a white board from a now-defunct shelving unit in order to prop up the rod in the middle. I have quilts hanging both to the left and the right of that support, though most of the ones to the right are not visible in this photo. On the front rod, where I hang the longer quilts, I was able to add another bracket from the ceiling to give it additional support in the middle. Finally, a closeup of the hangers. The quilts are folded gently, and nothing is creased. 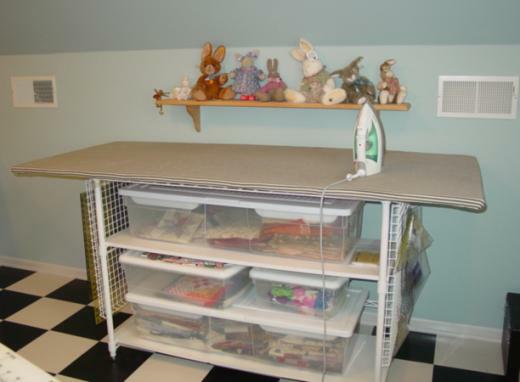 That's it for the sewing room. If you'd like to visit my house as it existed in 2002, click here. Thanks for coming along on the tour. Have fun visiting the rest of JudyMartin.com.